This month may well be a good time to spot water voles, as second litters of juveniles take their first foray into the outside world. Of course, like anything worth seeing, they are notoriously difficult to spot amongst water-side vegetation, but look for ripples and listen for ‘plops’ as they take a dip. As made famous by ‘Ratty’ in The Wind in the Willows, who was actually a water vole, the two species are frequently confused. Such confusion strikes me as odd, as the common perception of the rat is a lot less friendly than of our furry vole friends. 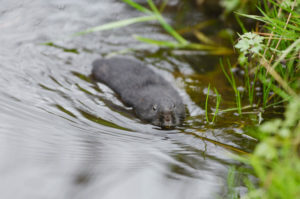 I met up with Iain Webb, Cambridge’s expert on water voles, and discovered that whilst swimming, the two species are easily distinguished: the rat holding itself above the water, the vole forming a cork-shape, low against the surface. Other differences include the rat’s pointed face shape, prominent, pale ears, lean body and pink tail, compared to the much chubbier, furrier and round-faced vole. Enough about rats, now that’s all clear. The question now is, has the intrepid Lizzy ever seen a water vole? Well, yes and no. I am, in fact, expert at scaring them out of hiding by mistake, and twice now on riverside walks I have alarmed brown blurs out of long grass and into the water. I am now longing for a calmer and more prolonged sighting. Things to look for include their water-side latrines and tracks, which are small and show forefeet with four toes, hindfeet with five. A peculiar habit voles and my hamster seem to share, is taking food to a particular favoured spot and half-eating it, leaving remains of chewed grasses and leaves for the observant vole-spotter. Of course the evening Iain and I chose, there was no sign of them, but I plan to keep looking. Iain showed me a map of vole territory from 2003-2008, and whilst certain areas (the midlands, the fens) are bustling with the rodents, parts of the country are distinctly bare. Several theories have been suggested, but Iain thinks that the south-west is particularly barren because of mink farms, from which many animals escaped. Mink are one of the water voles’ biggest threats (besides human activity) as they have huge appetites and can swim faster than voles. Other predators include stoats, owls, herons, large fish, foxes and domestic cats. The rodents have become the ‘panda’ figure of the UK, the furry face of conservation, as wildlife charities stress the importance of preserving the British landscape and wildlife. 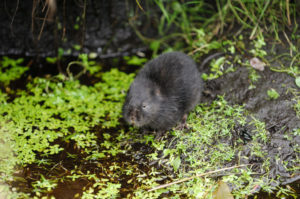 Water voles are a protected species after a drop in numbers of 90% between 1990 and 2000, owing largely to changes in farming methods and predation. However, thanks to the brilliant work of conservation groups including the Wildlife Trust and the Mammal Society, things are looking up for our furry friends. The People’s Trust for Endangered Species spent £1 million trying to eradicate mink and reintroduced voles to new areas, meaning their numbers are now around 500, 000 (compared to 200, 000 in the year 2000). These results prove that voles numbers are quick to recover, as they produce large numbers of young (between 5-8), sometimes twice yearly between March and August. The young weigh around 10g, and stay with their mother for 22 days. Babies are raised in burrows dug adjacent to slow-moving water, and surrounded by vegetation to provide cover. As voles are only semi-aquatic, and less suited to water than otters, they spend large periods of time eating beside the water, or snoozing in their cosy grass-lined burrows. These burrows are elaborately long and complex, with sleeping quarters at the highest possible level within the bank, to avoid flooding, and often involving under-water escape passages. Vegetation is what makes up water vole meals, with 227 different plant species having been identified within their diet, including grasses, bulbs, roots and occasionally fruit. Water voles and riverside romance…what could be more British?